Language Editor allows handling .lng files. 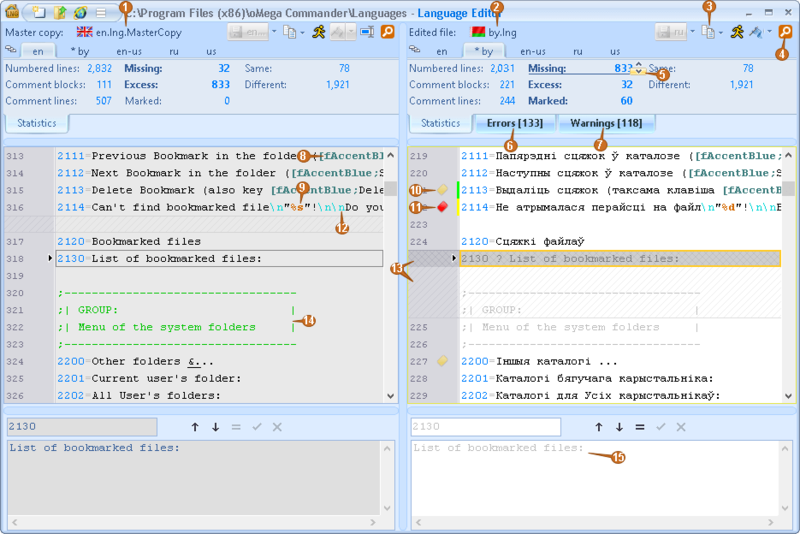 It helps reducing errors and mismatches by letting see the original and edited files. The original file isn't usually edited. Can be used for spell checking in an external program. Navigation to the next similar line. In this case the translated file is missing an appropriate formatted construction "[fAccentBlue;…]". In this case the translated file in parameter "%d" doesn't match parameter "%s". means missing these lines in the file (shows lines from the opposite file). More significant text has darker background. Any text, not starting with digits is considered a comment. After editing press key Down to go to the next text.